Is the way they supply the Earth with a drink. They nurture all creatures, they make the grass grow. When Mr. Sun shines on them, my, how they glow. To splash in them, dance in them, excited and wild. Yes, puddles are surely a gift from the sky. From little, bright gumboots, to tops of small heads? A bit of the sky has been given for play. Best get in and enjoy before it dwindles away. 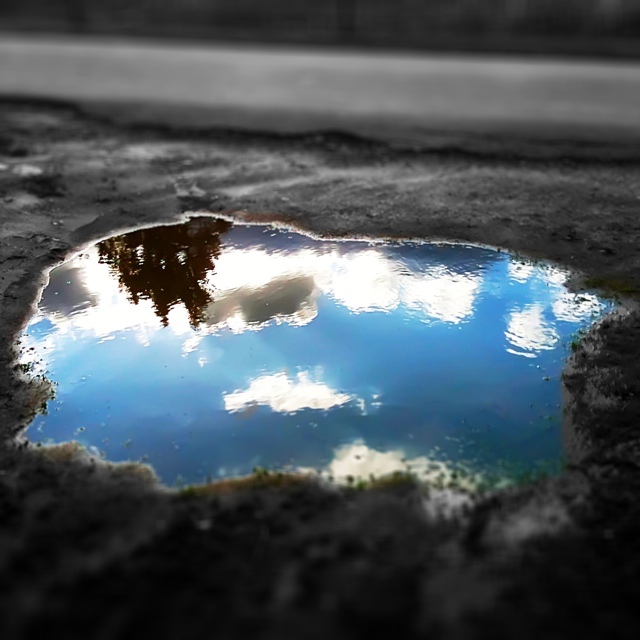 That’s the thing about puddles, they never last long. So they have to be cherished before they are gone. The pleasures they offer, to all, near or far. SPLASH! Skwadra means "she who laughs most of the time" Thats me, Karin Andersson. Welcome to my kingdom, The Kingdom Of Red Barns. Det här inlägget postades i A Piece Of My Day, Tacksamhet och har märkts med etiketterna Puddle, reflection, sky. Bokmärk permalänken.